I have a Delta unisaw 3hp single phase that i am currently restoring/ repairing. 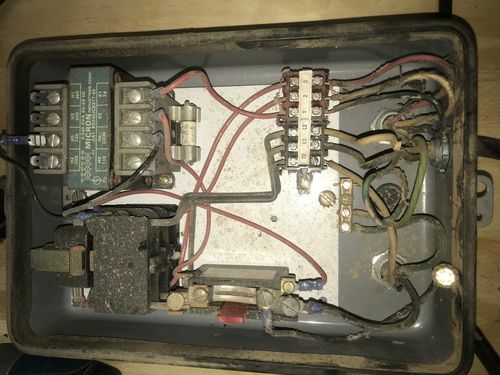 The wiring is pretty much all shot…dry rotted and dangerous so i am replacing it all. I have all the wire i need to get it up and running except the wire that leads from the LVC to the switch. It has 4 conductors but i do not know what size it is because its so dry rotted. Wonder inf anyone on here that has this saw with LVC could tell me what size wire it is i need? 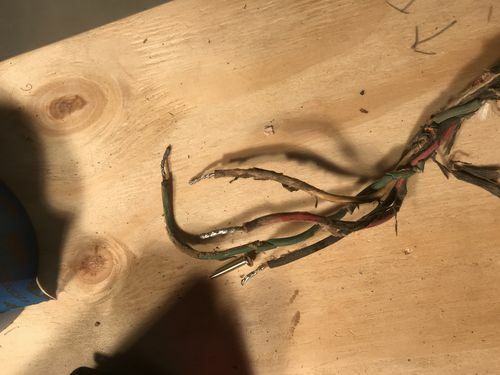 It’s low voltage (24v), so you don’t need anything special.. I’ve even seen people use HVAC thermostat wire, but any good 16 or 18 gauge wire will be just fine. Also, are you sure it has 4 wires? 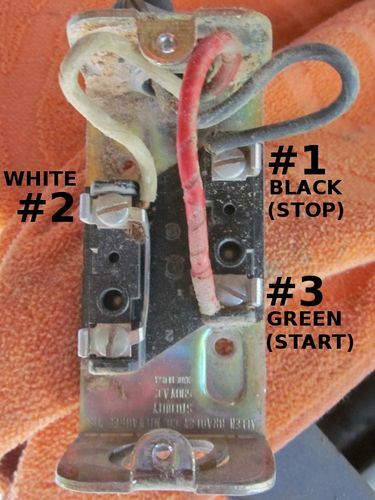 Should only need three to the control station (on/off momentary switches) – unless you have something different. 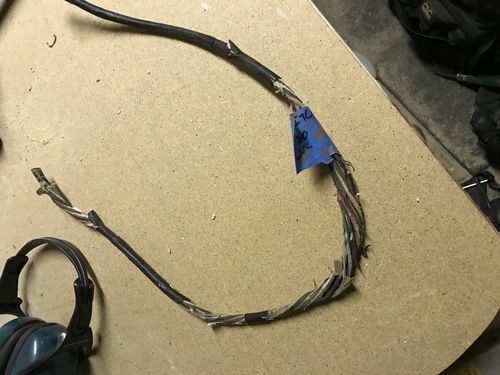 Yes I am sure it’s 4 wire…I’ll attach some pictures. 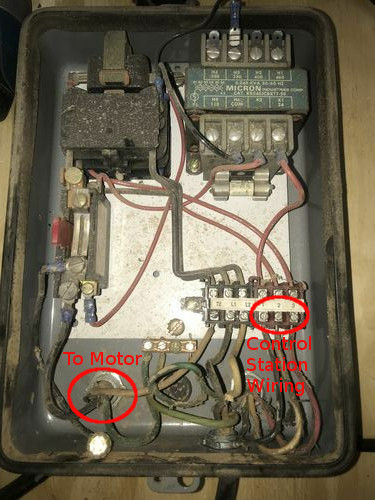 I don’t know what you are looking at, but it’s three wires to the control station, marked in the photo below. Motor hooks up to T1 (from heater) and T2. Supply voltage hooks up to L1 and L2. 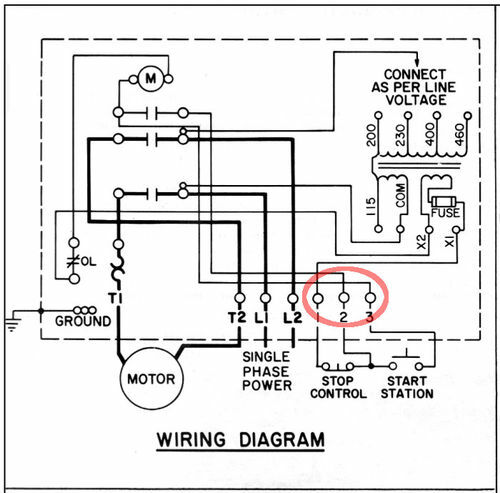 Control station hooks to terminals 1,2 and 3 circled in the picture (black, white and red wires). Hard to see in that picture but it was grounded. I’m realizing now it’s orobsbly because the switch is in a metal box?? It s low voltage (24v), so you don t need anything special.. 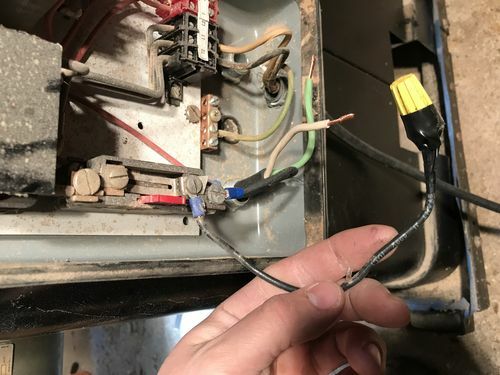 I ve even seen people use HVAC thermostat wire, but any good 16 or 18 gauge wire will be just fine. A wire that should be removed and thrown in the trash. Looks like they maybe were powering something else coming off the overload, but then capped and taped it up. Doesn’t do anything and is not needed. Do you know where I can get a Replacement overload?? Went to remove the wife and the whole thing crumbled apart. Just when I thought I was close to having it up and running!! 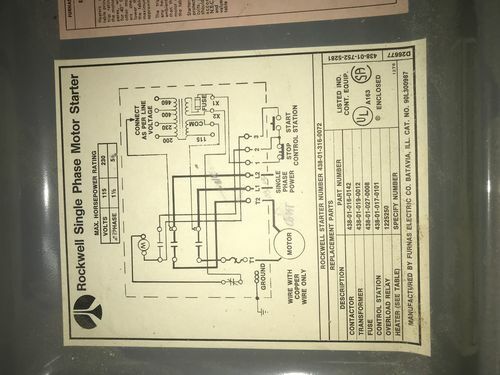 The whole assembly or just the heater element? Might be a bit of a search to find an exact replacement, but you could substitute an appropriate sized one. Give a local electric supply house a call and tell them what you need – if they can’t help, I’m sure they could give you some pointers on where to look. I don’t know what motor you have on there, but it if has a built in overload, then you could just bypass that one. Heck, you can bypass it anyway just to get you up and running and it will be fine as long as you don’t push the machine too hard. At least that will let you use it while you search for a replacement. Great typo. I got a good laugh out of “went to remove the wife” and then Brad telling you “at least that will let you use it while you search for a replacement”. The insulation on those wires is amazing. It is a good thing you are replacing them. Haha I didn’t even notice my typo!